The 24th International Conference on Nuclear Engineering (ICONE24) was held in Charlotte, USA, July 26th – 30th, 2016. ÅF was represented by Lingfu Zeng of Nuclear Engineering. The International Conference on Nuclear Engineering (ICONE) is the premier global conference, which since 1991 has been annually held in American, Asian and European continents for addressing the current and future needs of the nuclear industry around the world. This year’s conference, ICONE24, gathered nearly 700 engineers and scientists in the world, to discuss the state-of-the-art techniques, the current status and future needs of nuclear power industries worldwide. The main theme of ICONE24 is “Nuclear Power — Reliable Global Energy”. In the conference, about 500 speeches delivered in over 100 technical sessions. Highlighting topics include: Plant Operations, Maintenance, and Life Cycle Management; Plant Systems, Structures and Components; Nuclear Fuel and Materials; Radiation Protection and Nuclear Technology Applications; Next Generation Reactors and Advanced Reactors; Small Modular Reactors; Nuclear Safety and Security; Codes, Standards, Licensing and Regulatory Issues; Radioactive Waste Management and Decommissioning, Thermal Hydraulics and Computational Fluid Dynamics (CFD); Reactor Physics and Transport Theory; Instrumentation and Controls (I&C); Severe Accidents and Beyond Design Basis Events; Innovative Nuclear Power Plant Design; Nuclear Education, Public Acceptance and Related Issues. 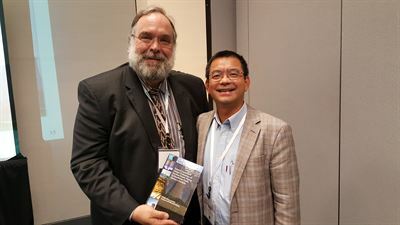 ÅF has been one of the conference organizers for the past conferences since 2009, with Lingfu Zeng as the Track Co-Chair for the “Codes, Standards, Regulation and Licensing Issues Track”. In the conference, Lingfu delivered a speech on structural integrity assessment methodologies. The next conference (ICONE25) will be held in Shanghai in May 2017, see http://www.asme.org/events/icone.